This versatile sauce from North Africa complements grilled fish and poultry. It can also jazz up vegetarian entrées. In food processor, combine cilantro, parsley, garlic, cumin, paprika, salt and ground red pepper. Process until finely chopped. Add broth, tofu, lemon juice and oil. Process until mixture forms a creamy sauce, stopping to scrape down sides of work bowl several times. Just before serving, heat sauce over medium heat, stirring until heated through but not bubbling. Chef Patsy Jamieson notes: This sauce can be made ahead. Place a piece of plastic wrap directly on surface and refrigerate for up to 2 days. 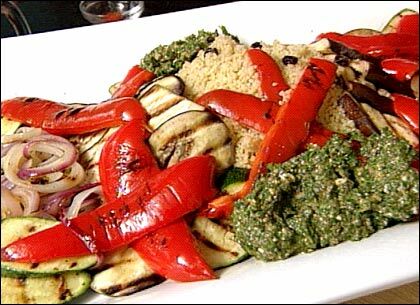 Here is an elegant vegetarian entrée featuring sweet grilled vegetables and a spicy herb sauce. It is an excellent choice when you are entertaining a group which includes both vegetarians and nonvegetarians — double the recipe, and supplement the vegetables with grilled chicken or tuna. Set fine-meshed grill topper on grill and heat grill. Spread eggplant, red pepper, zucchini, onion and tomatoes in a single layer on a baking sheet. Spray with cooking spray and season with 1/4 teaspoon salt and a grinding of pepper. Turn vegetables over and spray again; season with 1/4 teaspoon salt and a grinding of pepper. In batches if necessary, place vegetables on grill topper set on gas grill over medium-high heat or on charcoal grill 4 to 6 inches from medium-hot coals. Cook 6 to 10 minutes, turning frequently and removing vegetables when they are browned and tender. (Remove charred tomato skins, if desired.) Keep warm. To prepare couscous: In medium saucepan, combine broth, oil and 1/4 teaspoon salt and pepper; bring to a simmer. Remove from heat. Stir in couscous and currants; cover and let plump 5 minutes. Fluff couscous with a fork. Meanwhile, in small saucepan, heat sauce, stirring over medium heat, until heated through. To serve, mound couscous in center of a platter or individual plates and surround with grilled vegetables. Drizzle sauce over vegetables and couscous. Sprinkle with almonds. Chef Patsy Jamieson notes: To toast almonds, place in a small skillet over medium-low heat and cook 3 to 5 minutes or until lightly browned, stirring almost constantly.